Medley has been a fixture in the local Miami scene as a supporter, promoter and DJ for over two decades. She is the driving force behind Subterranean Industry and Geishaz.com, two entities responsible for booking promoting and recruiting a wide variety of artists and DJ’s and helping local underground music and scene preservation. Music has been a part of her life at every corner. By age 10, she was studying Flamenco guitar, musical architecture, and music theory. In 1993, Medley started collecting records and in 2000 decided to put her vinyl to use and get serious about DJ’ing. For ten years, Medley was a resident on www.thewomb.tv, an online radio station that streams both audio and visual. Audiofusion-Free Bass Sessions was heard every Wednesday all over the world from 10pm to 12am EST. Medley was part of the Transient Force label which consists of well-respected Electro DJs and Producers from all over the globe. 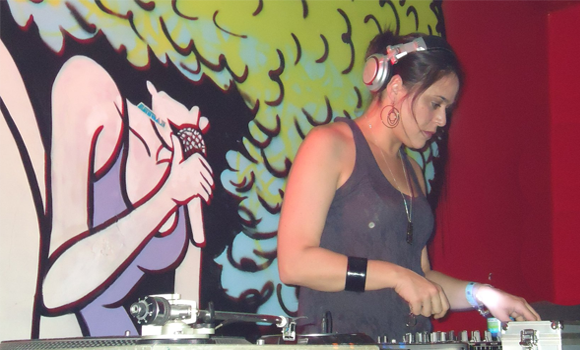 She is also part of the Dadeabass crew and the Electronic Ensemble, a 5 DJ Band. For over 2 years, Medley handled the electro buying for local Hollywood, FL record shop, Backdoor Records. She helped provide many other DJs with both new releases and classic finds. Because of a personal contact at Syntax Music Distribution in NYC, Medley also helped many independent Electro record labels from the US and Europe get their releases in the warehouse for distribution in record shops and other record distributors all over the world. Medley is not only a DJ, but has promoted events with artist such as, Afrika Bambaataa, Rabbit in the moon, Dynamix II, Jackal and Hyde, Perry Ferrell, Snoop Dog and Hardkiss. She has also worked with and promoted for Ultra Music Festivals, 8track productions and various street teams throughout the years. This helped pave her way to promote her own events. She began an all Electro monthly, Electro Static Discharge, located at Lounge 16 on Miami Beach. This was a staple for almost 3 years for both locals and the many out of town visitors who have become accustomed to the vibe that is inviting and so thick it fills the air. Medley is responsible for booking underground Electro artists like, Ectomorph, Mr. Velcro Fastener, Alpha 606, Nomatic, Dagobert, Cosmic Force, ATF, Doc Nasty, Evac, Paradox, Kitana One, Drone Operator and many others. She also was working with Laundry Bar/Black Sheep for two years on South Beach holding a monthly electro event in order to keep a home for the local DJs and supporters to escape to. Medley continues to dj at clubs, retail stores, art galleries and live shows to this day and is the webmaster for the Geishaz. Medley’s style can be described as beautifully vicious with an underlying tone of sensuality with a touch of quirkiness thrown in when the mood hits her. Medley’s love for the music comes out in her sets and in her attitude.